Does an Inverted Term Structure Lead to Recession? Given the yield curve has been in the news as of late, we wanted to re-share Astor’s views. Much has been made of the flattening yield curve trend that has developed over the past year or so. Yield curves that are inverted, with short-term rates higher than long-term rates, have historically preceded recessions in the United States, and so it is useful to explore the term structure as a potential signal of economic downturns. Of course, the term structure is one of many data points that we at Astor Investment Management look at when investing in fixed income, and a flattening curve has implications for our Active Income strategy. In general, the longer duration the bond, the greater the duration risk. To compensate for this risk, the yield curve most often slopes upwards, with longer term rates commanding a higher yield than shorter term rates. But this relationship does not hold every day and has begun to reverse of late (see chart 1), with spreads declining to 1.08% in April 2018 from a post-recession high of 3.69%. Were this trend to continue, the yield curve could plausibly become inverted, with longer maturity Treasuries yielding less than short term. The relatively low return for the extra risk of long duration bonds is one reason Astor’s Active Income product has had a duration target below its benchmark for the last few years. There is a clear and established empirical relationship between yield curve inversion and future economic downturns. The yield curve has inverted prior to previous recessions, and so it seems reasonable to be concerned about a future inversion. Research indicates that the spread between three-month Treasury bills to ten-year Treasury notes has the strongest statistical relationship to future economic downturns. Indeed, yield curve inversion for our chosen maturities has preceded the last seven recessions several months in advance—albeit with four false positives. A simple probability model (chart 2) from the NY Fed illustrates this powerful predictive correlation. 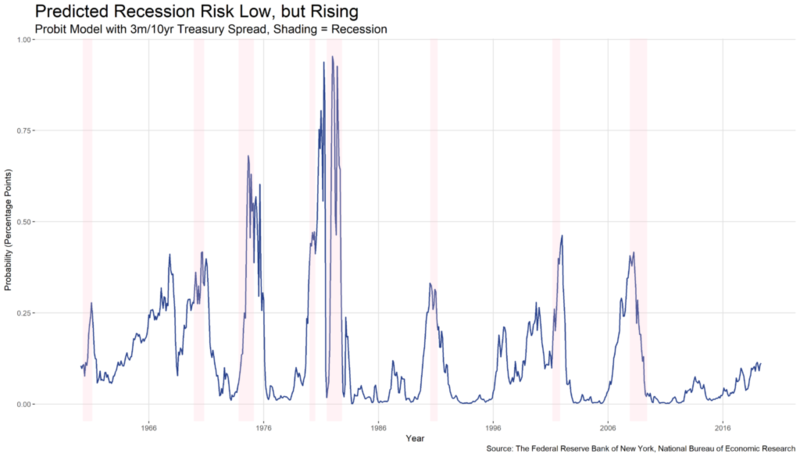 As the model indicates, recession risk has begun to move up but remains at a low level. Beyond the empirical relationship, it is worthwhile to better understand potential mechanisms and drivers for both the yield curve and output. Market participants should consider possible rationales from economic theory that can signal whether the term structure is flattening for reasons that are benign or more worrisome. Deteriorating fundamentals would be in the latter camp. The direction of monetary policy has a dual impact on and through interest rates and the U.S. economy. For example, a tightening in monetary policy in response to an uptick in inflation (an accurate summary of our current environment) will raise short-term interest rates faster than long term rates, which are subject to longer term expectations. Ceteris paribus, tightening, in our view, will also contribute to a slowing down of economic growth over the medium term. Investor expectations also play a role in determining the shape of the yield curve, with a rise in short-term rates leading to an expected decline in long-term rates as inflation pressures lessen. Put differently, if investors expect economic growth and corresponding inflation to be strong over the long term, long term yields will rise. The yield curve is also theorized to have a direct impact on the economy through financial market conditions. Banks borrow at short term rates and lend at long term rates, and so a narrower spread reduces the financial sector’s margins. That said, recent developments may not be indicative of a cyclical downturn. The Astor Economic Index®, our proprietary model of the current US economic state, is still near the top of the range it has been in since 2014. Given strong economic fundamentals, it seems plausible in our view that the yield curve is flattening for more technical reasons. The factor most often cited, with some justification, is an uptick in demand for long-term bonds. Large institutional investors have increasingly turned to longer-dated tenors in the search for yield. Despite recent tightening by the Fed and record new issuance in 30-year Treasuries, this low-for-long environment has been exacerbated by continued bond purchases globally by the European Central Bank and Bank of Japan. Structural trends may also be at work, with persistently weak inflation contributing to lower future inflation expectations and thus lower demanded long-term rates. This environment is factored into our analysis for Astor Active Income, as we look towards tweaking duration and credit risk. Viewed as a whole, none of the explanations for yield curve flattening today would suggest serious worries about the path of future economic growth. 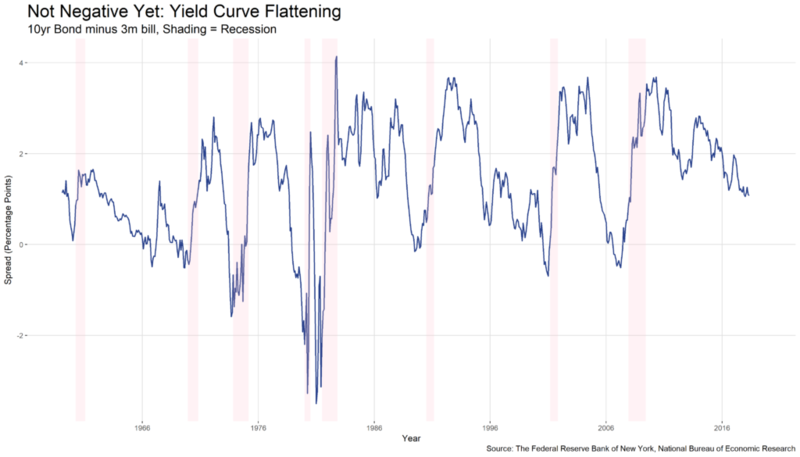 The broader takeaway in our analysis is that while the yield curve has historically been a strong indicator of recessions, we need not blindly accept a recession as our fate should the yield curve invert. Rather, developments in the term structure are best seen within the broader context of the economy and financial markets at large. Recently the Astor Active Income strategy has taken advantage of the relatively high risk-reward outlook (as we measure it) in the high yield sector while avoiding what we see as the “return-free-risk” in the longer duration treasury market. We believe that in a period where the yield curve may invert, followed by its typical re-normalization, it is prudent to have a dynamic fixed income strategy which can adapt to changing times with fixed income portfolios that are able to move along the duration and credit gradients. Our Active Income program is just such a strategy, implemented in highly liquid and inexpensive ETFs. Contact your Astor representative for more information.